CLASSIC top mounted shutters are a basic top mounted roller shutter system. The inspection cover is mounted at the front of the casing. They can be mounted on windows where the maximum thickness of the window frame does not exceed 95 mm. They are not available with a mosquito screen. CLASSIC shutters are ideal for containers and other industrial facilities. The wide range of veneers allows the precise matching of the guide rails to the window color. Slats can be made of aluminum PA 39 and PA 45. CLASSIC shutters can be operated manually or with electric drives. A central control system can also be used. Perfect workmanship, fissure-less mounting to the window and very good thermal insulation of the casing provide comfort for many years of use. TERMOLUX shutters are one of the best systems of roller shutters, which can be used in newly built or modernized buildings. The inspection cover is mounted on the bottom of the casing - which allows the casing to be installed from the inside of the house, without worrying about service access to the shutters. TERMOLUX SHUTTERS can be mounted on windows where the max. thickness of the window frame does not exceed 95 mm. TERMOLUX shutters are not available with a mosquito screen. The wide range of veneers allows the precise matching of the guide rails to the window color. Slats are made of PA 39 and PA 45 aluminum profiles. TERMOLUX shutters can be operated manually or with electric drives. A central control system can also be used. Perfect workmanship, fissure-less mounting to the window and very good thermal insulation of the casing provide comfort for many years of use. INTERLUX shutters are one of the best systems of roller shutters, which can be used in newly built or modernized buildings. 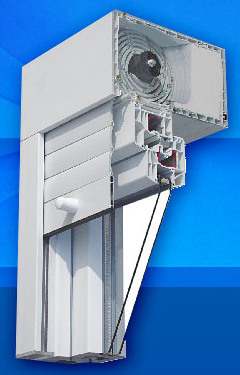 Construction of the INTERLUX casing allows you to mount it on a window frame with a width up to 205 mm (e.g. HS type sliding doors). The inspection cover can be made at the bottom or front of the casing. A bottom cover can be used if the width of the window frame does not exceed 100 mm. Then, the shutter casing can be installed inside the house without worrying about service access to the shutters. If the thickness of the window frame is greater than 100 mm, a front cover must be used. INTERLUX shutters with widths from 0.55 m to 1.5 m and maximum surface area of 4.5 m2 can be integrated with a mosquito screen. Slats are made of aluminum profiles PA 39 and PA 45. The wide range of veneers allows the precise matching of the guide rails to the window color. INTERLUX shutters can be operated manually or with electric drives. A central control system can also be used.